Traveling to a new city is a feeling that you can't quite explain. It’s nervousness mixed with giddy excitement mixed with a little bit of anxiety. But nonetheless, I could barely sit still in my seat on the airplane I was so elated to finally be heading abroad for the first time in years. For my trip to London, I was excited to pull together outfits that would help me to fit in to the culture and embrace the fashion and trends overseas. For my first look, I wanted to make sure I was comfortable while flying since I would be taking a Red-Eye flight from Boston and landing in London at 8:30 am. Since I wanted to pair style with comfort, I went with a cute and comfy sweatshirt paired with moto leggings and my velvet sneakers in the same blush pink color as my sweatshirt. To top it all off was my black trench coat with big gold buttons. 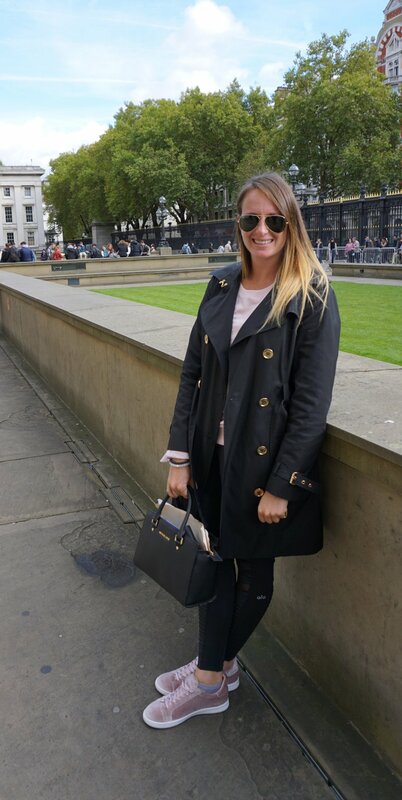 It was the perfect travel outfit that helped me transition into the London Fashion scene with ease. Outfit details linked below! The Micheal Kors Trench Coat is from a few seasons ago, and the Sam Edelman shoes are I wrote about in a previous post are sold out, but I’ve linked similar choices that will complete the look.